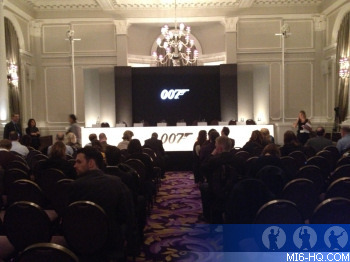 Welcome to the inaugural MI6 Live Blog for the Bond 23 press conference, held in central London from 11:45am GMT on Thursday 3rd November 2011. The most current updates will be posted at the top, so you will not need to scroll down. All times are local London, UK. This live blog will continue to be updated with commentary and media links after the press conference is completed. 20:44pm That's all for now Bond fans. It has been a thoroughly exciting day. Stay tuned to MI6 for further in-depth coverage as SkyFall starts principal photography. You can stay up to date by visiting the homepage, or through the RSS, Facebook or Twitter feeds. MI6 Live Blog will return. 19:12pm You can now watch the complete 30-minute press conference video via this page. Listen out for the Connery trivia right at the start, as pointed out by MI6 in this article yesterday. 16:19pm Daniel Craig on the SKYFALL title: 'You can't keep anything secret these days" - MI6's finest. We leave briefcases on trains. 15:30pm Gentlemen may prefer blondes, but this incarnation of James Bond doesn't, as brunette Bernice Marlohe and raven-haired Naomie Harris join the 100% non-blonde list of Daniel Craig's female co-stars. 15:23pm The BBC has a couple of mini video interviews online. Daniel Craig says the title SKYFALL is very key, and has both emotional and geographical connections to the plot, and that he wants to make the very best film possible to honour the 50th anniversary. New Bond girl Bernice Marlohe says she couldn't believe she had won the role until days after she was first told. 15:15pm Trivia time: SKYFALL is the first James Bond film to start with the letter 'S'. It is also on par with 'Dr. No' as joint shortest, if you count punctuation. The fan shorthand will be 'SF', following: DN, FRWL, GF, TB, YOLT, OHMSS, DAF, LALD, TMWTGG, TSWLM, MR, FYEO, OP, AVTAK, TLD, LTK, GE, TND, TWINE, DAD, CR and QOS. 15:13pm Here are some of the things we don't know yet: composer, title theme artist, credit sequence director, Bond's car. Given the return to 'Casino Royale' alumni, it would not be unreasonable to assume we'll see some more old faces back. 13:24pm It may be worth pointing out the obvious - Daniel Craig is still sporting his beard from the Tin Tin premiere. If shooting is starting today around Whitehall, could 007 be unshaven for part of SkyFall? Studio production does not start until Monday, though. 13:20pm The first title treatment has been released. It confirms the 'F' in SkyFall is a capital letter. One of the many minutiae that will be cleared up as the day progresses. 13:13pm BBC News has uploaded the first video from the press conference - 4 minutes from the Q&A. Click here to watch online. 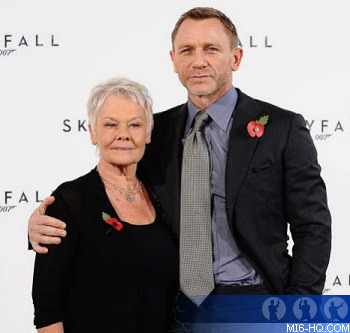 13:09pm Dame Judi Dench will be front and center of SKYFALL as M's past is integral to the plot and MI6 'comes under attack'. 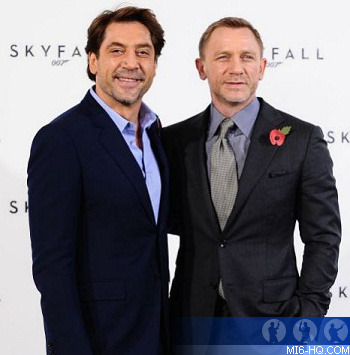 13:08pm This is perhaps one of the few photos you will see Daniel Craig (Bond) and Javier Bardem (villain) together, both smiling. 13:04pm After the press conference wrapped, Daniel Craig posed at a photocall with the new Bond girls Bernice Marlohe and Naomie Harris. 12:41pm "We're so delighted to have Sam Mendes direct SKYFALL and be working once again with Daniel Craig. We've a great script, an extraordinary cast and an incredibly talented creative team for this latest James Bond adventure," said Wilson and Broccoli. 12:41pm The Director of Photography is Roger Deakins, Production Designer is Dennis Gassner (who previously designed Quantum of Solace), Editor is Stuart Baird (from Casino Royale), Costume Designer is Jany Temime, 2nd Unit Director is Alexander Witt (Casino Royale), Stunt Co-ordinator is Gary Powell (his third Bond outing in this role), SFX Supervisor is Chris Corbould (long time Bond family member) and Visual Effects Supervisor is Steve Begg. 12:33pm The first official plot synopsis is out: "Bond's loyalty to M is tested as her past comes back to haunt her. As MI6 comes under attack, 007 must track down and destroy the threat, no matter how personal the cost." 12:23pm From left to right, the panel was Bérénice Marlohe, Javier Bardem, Naomie Harris, Dame Judi Dench, Daniel Craig, Sam Mendes, Barbara Broccoli and Michael G. Wilson. Video of the entire event is expected to be available later today. 12:20pm The press conference has concluded. The panel did an great job of keeping everyone engaged for 30 minutes whilst still not giving too much away about the film. Not a huge amount of surprise for MI6 readers on the details revealed, except perhaps the Severin character name which was largely thought of as tabloid bunkum. 12:17pm When the panel is asked if the reason why three character names have not been revealed it is because fans would recognise them, the audience is told the question is well phrased and hint that is exactly the reason. 12:15pm Barbara Broccoli responds "Definitely!" when asked if Daniel Craig will do more Bond films after SKYFALL. Craig himself says "If I could do this for a few more years then I'll be happy." It seems he will be on for Bond 24 at the very least. 12:14pm SKYFALL will be similar in tone to 'Casino Royale' - news which will be received well by the vast majority of fans. Daniel Craig confirms he does have a shirtless scene, too. Bond Girls rejoice. 12:12pm When asked, Sam Mendes hopes to direct another Bond movie "if this goes well". The title SKYFALL has an 'emotional meaning' which will be revealed in the film. Quantum will not be involved. 12:10pm The new girls have been busy honing their skills. Harris has been doing Yoga three times a week, stunt driving, and firing machine guns - which she loves - stunt training, jumping out of cars and running up and down stairs. Marlohe has been shooting guns, too. 12:06pm Mendes responds to the tabloid chatter about his desire to scoop Oscar nominations given his incredible cast. "It's not the reason you do a movie and not the reason you do a Bond movie. For me, Bond movies are for the audience and what happens afterwards is out of my hands." 12:06pm Javier Bardem is talking. "Who told you a villain is a bad person? For me, it's an honour to be at this table for many reasons. It will be fun to do." 12:05pm The budget for SKYFALL will be similar to 'Quantum of Solace' - nothing will be cut back, and nothing in the script has been cut back from their plans. 12:02pm Bérénice Marlohe will play 'a glamorous, enigmatic character called Severin'. The tabloid press actually got that one right. Confusion with the villain's name from the 'Carte Blanche' novel is bound to ensue, despite confirmation that SKYFALL is not related to any existing Bond property. 12:02pm Naomie Harris says she has spent two months training for her role. She will play a field agent called Eve. No word of Miss Moneypenny being in the film. 11:58am The reason the press conference is being held in a central London hotel and not Pinewood Studios is because shooting today is based around Whitehall. 11:55am Daniel Craig confirms principal photography on SKYFALL starts today. "Tremendously excited by the people we've got in the movie. We've assembled an incredible crew," he says. 11:54am The cast is confirmed: Daniel Craig, Javier Bardem (villain), Bérénice Marlohe, Dame Judi Dench, Naomie Harris, Ralph Fiennes, and Ben Wishaw. The first five are on stage. 11:51am Director Sam Mendes confirms the locations as Shanghai, Istanbul and Scotland. The script by Purvis and Wade and Logan is 'fantastic'. It will have a lot of action, despite press rumours to the contrary. 11:48am Producer Michael G. Wilson confirms the title of the 23rd James Bond film is SKYFALL. 11:29am Exactly 50 years ago, Sean Connery was announced to the world as James Bond 007 for the first silver screen adventure "Dr. No". There will be no surprises like that today as Daniel Craig will be coming back for his third outing as 007. 10:57am The stage has been set for 9 - will we be seeing 4 cast members? 10:53am Journalists from print, TV and radio - and MI6 - are inside. The event is about to kick off. 00:00am Live coverage on this page will commence today at 11:00am GMT (12:00 CET, 07:00 EST, 04:00 PST). 00:00am Welcome to the inaugural MI6 Live Blog. We will be keeping you up to date with all the latest developments from the Bond 23 press conference and the subsequent media coverage. Reaction and comment will be included - just send your messages via Twitter or Facebook via the links opposite. 00:00am Albert R. Broccoli’s EON Productions, Metro-Goldwyn-Mayer Studios and Sony Pictures Entertainment are delighted to announce a launch event to mark the start of production on the 23rd James Bond adventure. Producers Michael G. Wilson and Barbara Broccoli will present new Bond director Sam Mendes and key members of the cast, appearing together for the first time. 00:00am If you are a Sky TV subscriber in the UK, and you have an Apple iPad, you will be able to watch a live stream of the Bond 23 press conference on Thursday. You will need to download the Sky News app via iTunes and sign-in with your Sky ID. It will also be available to subscribers through Sky Active. Send your thoughts and comments to us via @jamesbondlive - the best tweets may be published in the live blog. Follow MI6 on Facebook for all the latest news and join in the comments with fellow James Bond fans around the world. All content © MI6-HQ.COM unless otherwise stated. Views and opinions expressed in Live Blog comments are those of the author/s and not MI6-HQ.COM. All comments sent to MI6 via Twitter or Facebook may be used here and edited for brevity or clarity.